I messed up. I over-fired a bisque load. It was careless and I still can’t figure out how it happened. Unfortunately, it isn’t the first time that I’ve done this…it is the second. The first time it happened, our kiln was full of small bowls. Although they didn’t take a lot of time to make, there were so many of them that we decided to try to salvage them. 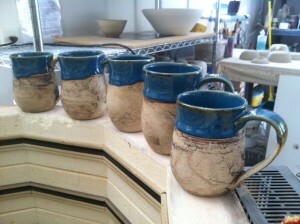 When bisque pots are fired to maturity, they are no longer porous and therefore do not absorb glaze. So the challenge to saving them is to get glaze to adhere to the pot during the re-firing. Vertical surfaces are especially difficult as the glaze often succumbs to gravity and falls off the pot. We averted this particular difficulty by applying iron-oxide to the outside of the bowls. In order to glaze the inside of the bowls, we heated them and applied several coats. The results were mixed. The iron-oxide was successful; but, there was a lot of glaze crawling inside the bowls. So we re-applied glaze to them again and re-fired for a third time – and several were saved. They say necessity is the mother of invention – or in our case, the mother of creativity. Since my debacle, we began incorporating iron-oxide into our surface treatment options when using runny glazes. Unfortunately, this most recent kiln load had an assortment of of pots. The larger the pot, the more prone it is to cracking when re-fired. We spent a day trying to salvage the pots that resulted in little success and a lot of ugly or broken pots. In fact, the only success was the mugs that Julie thought looked like ancient maps. The lesson learned from this most recent episode is sometimes we need to cut our losses. Love your “mistakes!” They are lovely!